Fall is upon us. 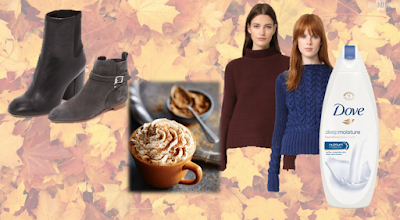 Time to indulge in pumpkin spice lattes, chunky cableknit sweaters, and supple calfskin booties. While you're busy improving your look don’t forget about your skincare. This season, we are answering the call to dial back summer's over the top glam style, and reinstate simple radiance. Embracing a new season means finding a new balance in your skin. The changing weather can be overly drying on unassuming skin (especially when it’s exacerbated by blasting office heat), so it's important to plan ahead. Altering your routine is as simple as swapping in a new body wash. This Fall, we revisited an old favorite, Dove Deep Moisture Nourishing Body Wash with NutriumMoisture. It consistently delivers that luxurious and clean feeling, while blasting away dirt and grime. In our fast-paced life, we appreciated seeing a noticeable difference after a single shower. If you fallen into a skin care rut, then let this be your opportunity to break out with a tried-and-true favorite. Want to try it out for yourself? We're giving one lucky winner a chance to stay fresh for the rest of the year. Enter to win the grand prize of THREE (3) Dove Deep Moisture Nourishing Body Washes with NutriumMoisture. THE FINE PRINT: The contest will be live from 9.8.16 and ends at midnight (EST) on 9.15.16. One winner will be chosen at random from among the entrants. The winners will be notified directly. Contest is only open to U.S. residents.